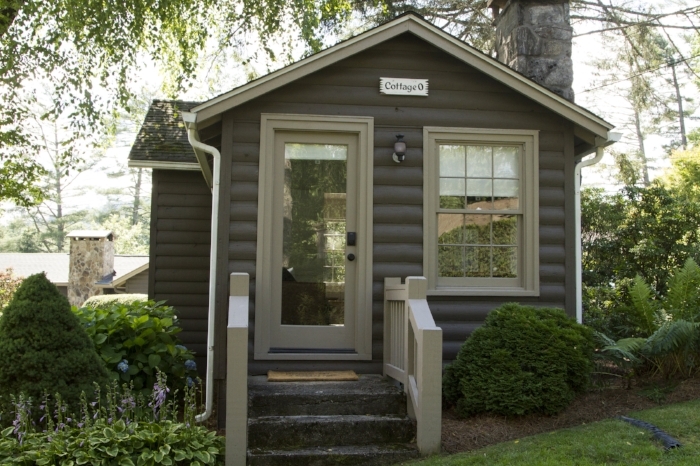 The Honeymoon Cottage is a 400 sq ft cottage in Highlands, NC. It is one of the original 1940s golfer's cottages at Highlands Country Club, and has a long history as a romantic getaway for newlyweds and couples alike. The cottage was updated and modernized in June 2017, yet it retains its rustic charm and features newly added luxury amenities. It also features a brand new bathroom and an updated kitchen, with painted wooden paneling throughout. The bright, airy walls and monochromatic design draw the eye towards the wood burning fireplace upon entering the front sitting room. A modern leather sofa and adjacent arm chair create an intimate and comfortable seating area. A wooden bistro table for two rests near the front window, ideal for morning coffee and reading the paper. The sleeping area and kitchen share the cottage's back room. The sleeping area features a luxurious queen-sized Tuft and Needle bed with Mt McKinley by Ansel Adams mounted above it. The kitchen is well-equipped with stainless steel appliances and a high-end SMEG refrigerator. Other conveniences include a french press and a milk frother. Additional amenities such as a luggage rack, Bluetooth speaker, and curated book library make this historic cottage truly comfortable. The renovated bathroom preserves the original wash sink, and new touches such as roller shades and a retro-style refrigerator were carefully selected to help the cottage retain its cozy atmosphere. The cottage is located a short 6 minute drive to downtown Highlands. The cottage is not affiliated with Highlands Country Club and does not provide access to the country club's amenities or golf course.